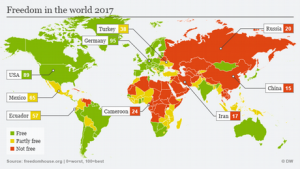 Despite calls for freedom of the press, we have seen more and more calls for censorship and government monitoring of reports on the internet . And this includes from Western nations (e.g. California considering internet political censorship; Canada again restricts speech and NY Senator proposing more censorship: Can this lead to Amos’ prophesied famine of the word? and Germany to force social media companies to report to ‘Big Brother’). Even those who speak out on certain issues are subject to ridicule. A couple of years ago, someone was chastised who publicly stated that as a Christian he could not support the homosexuality of a US basketball star. He was essentially told that those type of comments are not acceptable in the “tolerant” society of the USA. A while back, the CEO of Mozilla felt compelled to step down because of pressures for him making a donation years ago that the homosexual lobby opposed. This entry was posted on Wednesday, May 3rd, 2017 at 12:01 am	and is filed under Prophecy.